Is it better to go in for non surgical Achilles tendonitis treatment or surgical treatment for Achilles tendonitis? This question about Achilles tendon rupture has not only plagued ordinary laymen but also expert medical practitioners for many decades. In the early days, Achilles tendon treatment in the form of surgery often left a huge scar on a patient’s leg, increasing the risk of him contracting infections post the operation period. The alternate method to surgery was to put a plaster cast over the patient’s leg and let it remain for a couple of months till the tendon was healed. The risk with this method was equally huge which included weakening of the calf muscles and formation of lumps on the tendon. But with time, there has been a lot of improvement in both surgical as well as the non surgical Achilles pain treatment procedures. These days, surgical procedure for Achilles tendon rupture is considered only if the pain is chronic and no amounts of pain killers are having an effect on the affected area. In general, in non-surgical treatments, the foot area is first given a complete treatment based on the R.I.C.E principle, after which the swelling reduces to a lesser extent. Once this is done, the patient can opt for a plaster cast which is uniformly distributed and covers the entire calf muscle so as to restrict its motion as much as possible. The other possibility is to go in for a boot which has adjustable rods and is much more effective when restricting the motion of the foot and the calf muscle. Comparative studies made in the year 1979 and 2009 have shown that there has been a significant improvement in the way Achilles tendon is treated these days and also in the success of the Achilles tendonitis treatment procedure in the long term. About 20 to 30 years ago, surgical procedures were mainly performed when it came to Achilles tendonitis treatment. The surgical treatment procedure then was considered to be risky as the incision that had to be made was about 16 to 20 cm long and this increased the chances of the patient getting infected post-op. Today however, a small incision is good enough to perform surgery on someone suffering from Achilles tendon rupture. This will also help with quick Achilles tendon recovery, without complicating things for the patient. Though a surgical procedure may not always be necessary, it has been shown that the Achilles tendon retains its complete strength better after a surgical procedure when compared to a non surgical procedure. Studies have shown that the tendon regains its original strength only if there is a definite amount of tension between the tendon and the muscles. The only way of doing this is by repairing the tendon ends. Athletes and sports persons who need their tendon to be in good shape generally go in for surgical procedures. These days an incision of about 5 cm is more than sufficient to set the tendon back to its original form. It is imperative that time is not wasted in getting surgical treatment as the tear in the tendon gets worse gradually which will only end up making the procedure more complicated. When you face the dilemma of choosing an Achilles tendonitis treatment method, always opt for medical advice from your physician and consult him before you take a call. The Achilles tendon, which is sometimes also called as the tendo calcaneous or the calcaneal tendon, is located in the posterior of the leg. It attaches the soleus, gastrocnemius and the plantaris muscles to the cafcaneus or the heel bone. This tendon, which starts at the middle of the calf muscle, is about 6 inches long and is the strongest and thickest tendon in the human body. 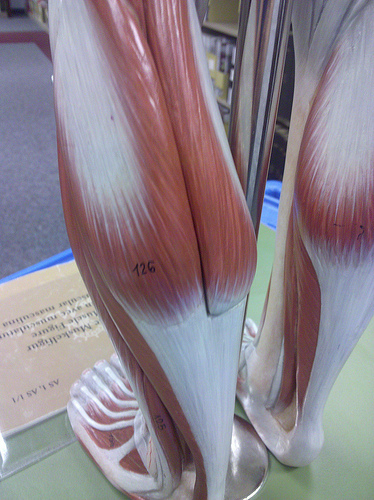 The lower part of the tendon stretches out laterally just before its insertion. The last 1.6 to 2 inches are covered by integument and fascia and the gap between the heel bone and the tendon is filled with adipose tissue and areolas. Achilles tendon rupture is a common disease that can occur due to excessive stress or prolonged jumping. Achilles tendon is most useful when there is a need to stretch the lower muscles in the shin and the heel bone. The tendon helps in various activities like stretching, jumping and walking. When the gastrosoleus muscle contracts, the foot plantraflexes, i.e. it gains the ability to move in an upward and downward angle. In short, the Achilles tendon transfers the power of the lower calf to the foot hence enabling it to move in an upright motion. According to a recent article by the Sports Medicine department of the Massachusetts General Hospital, the contraction of the outer gastrocnemius and the inner soleus muscle enables the heel to rise slowly while transferring the weight from the foot onto the toes thus making climbing and springing possible. The Achilles tendon is different from other tendons in the body in yet another way. Where almost all the tendons have a sheath or a covering that reduces wear and tear to the tendon by friction, the Achilles tendon has a softer tissue covering it. 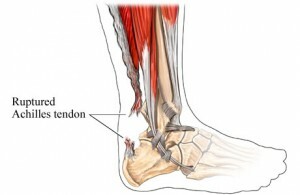 As there is limited blood supply to the tendon, it is highly prone to injuries and can take a long time to heal. Its functionality is also severely reduced due to frequent wear and tear and aging. Injuries to the Achilles tendon are common among people of all ages. The rupture to the tendon is generally caused by a sudden and immediate plantraflexion of the ankle or if the foot moves in a direction outside its regular motion. Other reasons or causes of rupture or Achilles tendon tear are excess stress on the tendon brought on in one act or by years of usage, putting too much effort in a single go after a long rest of the tendon and severe sports. Some antibiotics also weaken the tendons in the body, especially the Achilles tendon. People who have had problems with the Achilles tendon or the muscles connecting that tendon before. People who have previously injected or are still injecting steroids directly into the Achilles tendon. The rupture is often associated with intense Achilles tendon pain and swelling. It can happen from a horrific sports injury or by one small misstep when walking. Achilles tendon rupture surgery can be taken up in order to rectify this problem. There are two types of Achilles tendon surgery that you can opt for, depending on your preferences, and you can consult your medical practitioner in order to learn about these types of Achilles tendonitis treatment.